A very recent impact crater on Mars, formed between July 2010 and May 2012 and captured by the Mars Reconnaissance Orbiter’s HiRISE camera in November of 2013. 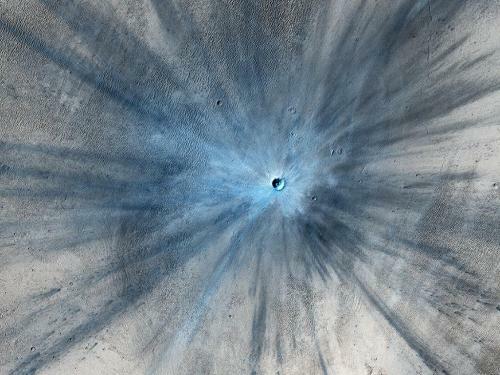 The crater is approximately 30m in diameter; the explosion threw ejecta up to 15km from the impact site. Areas in which the red Martian dust has been blown away show as blue in the HiRISE image. This entry was posted in Front Page and tagged astronomy, crater, mars, mars reconnaissance orbiter, Posthorn, Repost, science, space, Tumblr on 05/02/2014 by John.